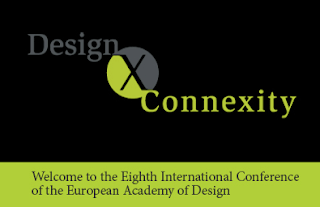 Design Connexity will be the eight International annual Conference of the European Academy of Design. The event will take place from Wed 1st April - 3rd at Greys School of Art and Design, Aberdeen. The concept of "Connexity" was coined by Mulgan 1998 who defined it through the growing trend of globalisation which creates a growing connectedness of all of our actions through social, environmental and economic issues. The above themes will be addressed through analysis of practice based research projects, a design exhibition and key note presentations from designer practitioners exploring these issues within their practice. I will be attending and shall upload a report on the proceedings.